We've seen a wealth of tablet PCs hitting the shelves recently, with varying degrees of quality and specifications on offer. Zoostorm's SL8 3310-9500 is the company's first attempt and proves an accomplished contender, with an exceptional screen helping it to stand out from the crowd. The 11.6-inch display features a 1366 x 768-pixel resolution, one of the highest we've seen from a tablet. Image quality is razor sharp, so websites are shown to great effect, but it was the quality of video playback that most impressed us. Both standard and high-definition movies look great, making this a perfect choice for those keen to view multimedia on a tablet. Its build quality also surpassed our expectations. The rubber casing not only makes this tablet comfortable to hold, but also protects it from scuffs and scratches. The chassis shows no detectable signs of flex, so should survive the rigours of daily family use, though the screen picks up smudges and smears quickly. Comprehensive connectivity includes two USB ports, for connecting a keyboard say, while a mini HDMI video out makes it easy to hook up the tablet to an external high-definition display, such as your TV. 802.11n Wi-Fi is present, while there's also a SIM card slot, so you can surf the internet whenever in range of a mobile phone mast – though you'll have to purchase a tariff and SIM card from a network provider first. Portability is also good. The 11.6-inch screen makes the SL8 one of the larger tablets on the market and the 1kg weight means it's a little on the heavy side, but it's still no problem to carry around. The 300-minute battery life is okay, but certainly not exceptional. 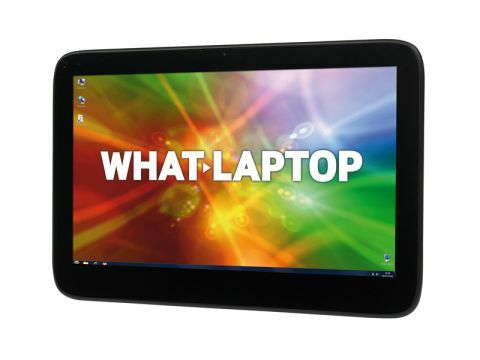 The tablet runs Microsoft's Windows 7 operating system. In the past we've found this to be an unintuitive platform when it comes to touchscreen devices due to the small menus, but the Zoostorm's large screen makes it much more accessible. Many will also appreciate the familiarity and compatibility Windows 7 brings, and you'll have no problem opening all your usual files, folders and documents, while Adobe Flash is supported, so you'll be able to watch video on the internet. The downside is that there's no App store to download games and programs from. The Intel Atom N450 processor provides limited power, which means you'll only be able to run one application at a time. The 32GB of storage provides basic space for storing your data, including media files to keep you entertained on the road. We were pleasantly surprised by the Zoostorm SL8 3310-9500, and those after a Windows 7 tablet would be hard pushed to find a better one elsewhere.